“Each of us has our own singularity,” says Schaeffer, “owing as much to the accidents of personal history as to the weather on a particular day. We have a sort of hedonistic computer in our brains, gauging pleasure against pain, constantly appraising actions. But it does not calculate what we see, rather our own inner state.” What is the difference between the 3.6% of respondents who reported that they had spent more than six hours exploring the Louvre in Paris, and the 6.5%, who spent less than an hour? One thing seems certain: we don’t all find the works in a museum equally appealing. Some people become totally absorbed by the art, while others do not. Some gallop round an exhibition in record time. But might there be underlying patterns governing such behaviour? Does it make any difference whether visitors are young or old, male or female, wealthy or not? The question of “publics” has become a key one for large museums. In the past few decades they have set up departments to try to define profiles and intentions. Every year yields its crop of records. In 2014 the museums operated by Paris city council registered 3.4 million visitors, up 11% on 2013, itself a record year. But the aim is not just to know how many people saw a show; how they responded to it is just as important. In the mid-1990s Beverly Serrell, a Chicago-based consultant, published a paper, The 51% Solution, reporting on research carried out in partnership with several leading museums in the US. The aim was to develop a better understanding of visitor behaviour. One of the things Serrell discovered was that visitors entering a museum tend to turn to the right and then move in an anti-clockwise direction. Since then sociologists, psychologists, marketing consultants and research labs have been monitoring visitors and their movements, using questionnaires and oculometers – devices that track and record eye movements and the points on which they focus – in an attempt to understand how we take in a picture. More recently, research has been done using the positioning functions of smartphones to keep track of where people go and interpret their decisions. In 1988, Musée Granet in Aix-en-Provence, southern France, asked a group of students to monitor visitors. This ethnographic research project, which culminated in a book, Le Temps Donné aux Tableaux (The Time Spent on Paintings), was led by sociologist Jean-Claude Passeron. Emmanuel Pedler, then a student and now Passeron’s assistant, recalls: “Actually we had no idea what stopping in front of a paint really meant.” He is currently finalising a new edition of the book. One of the most famous pieces on show at Musée Granet at that time was Manet’s Déjeuner sur l’Herbe. There were also several works by neoclassical painter Jean-Auguste-Dominique Ingres. To their surprise, the two sociologists observed that visitors spent longest looking at a couple of rather academic items, apparently of secondary interest, by Pierre Révoil and François Marius Granet, respectively. Passeron, a former disciple of French intellectual Pierre Bourdieu, was delighted. 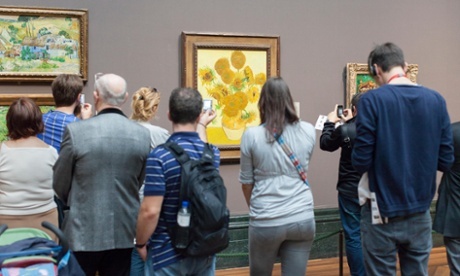 In L’Amour de l’Art (The Love of Art: European Art Museums and Their Public) Bourdieu highlighted the innate nature of talent or taste, demonstrating the force of social determinism in our relation to culture, particularly pictorial art. In the process he showed how the legitimacy of a work affects the extent to which it appeals to people. There is a broad consensus that museums have become a place for “testing one’s limits”, the opportunity for those who venture there to take risks. And sociologists are now convinced that when it comes to culture, the divide is not a matter of money but of education. A Swiss professor of psychology, Rolf Reber, has hatched his own theory about why we stop in front of a particular painting. It is a matter of “fluency”. This means that when it comes to grasping an idea or learning a subject, we would rather keep things simple. Excepting that if something looks too straightforward, we may end up thinking it is of no interest. “If a hidden structure appears underpinning some complex task, the ease with which we perceived the task may come as a surprise. Making it all the more appealing,” Reber explains. With regard to contemporary art, which is “difficult to perceive and interpret”, Reber fleshed out his theory with the “psycho-historical framework” concept, conceived by Dr Nicolas Bullot, a philosopher of cognitive science at Australia’s Macquarie University. According to this approach, our attachment to a work of art depends on our understanding of its artistic and historical background, which offsets any difficulty we may have perceiving it. After all, German philosopher Immanuel Kant thought that a good work of art makes our mental faculties – perception, imagination and understanding – resonate. “It would be chaos if our brains tried to process everything we see,” says Jean-Marie Schaeffer, head of the Arts and Language Research Centre in Paris. His work focuses on perceptive constraints and the way creative artists tend to play on these constraints, sometimes even thwarting them. “We know that the more familiar a stimulus is, the more automatic processing of information will take the upper hand,” he adds. “If a predator is coming straight for us, we need to respond quickly. The worry is that at some point the reflex no longer works. It is limited by boredom. “The fact that our brain works on the least-effort principle is contrary to what we expect of a work of art, which has always been something deliberately designed to prompt an experience. That’s why artists often deploy defamiliarisation techniques. Consciously or not. A successful aesthetic relationship strikes a good balance between factors which facilitate and others which inhibit understanding. Our relation to a work of art is always somewhere between these two limits,” Schaeffer says. Cognitive psychology, which studies mental processes, draws a distinction between two forms of processing. One is convergent, attempting to classify data as quickly as possible; the other is divergent, trying instead to delay classification. Still, there is no hard and fast rule. “There are a thousand and one ways of visiting a museum, and none is better than the others,” says Anne Krebs, head of the studies and research department at the Louvre.